Unusually I had a couple of mid-week days off, so on Thursday Andy and I made plans for a week day trip. Our last visit to Water Icicle had been thwarted by bad air, so we decided to have another attempt to see the extensions. As there was no rush I picked Andy up at 10am and off we set. The weather was horrendous on the trip over to pick up Mr Grimes and didn't ease up for the entire journey. Chatting away and with a heavy spray on the roads I sailed past my M42 exit and wound up taking a scenic route up the A444 adding almost an hour to the journey! Eventually reaching the farm track we slipped and slid up muddy puddles, at one point with Andy donning wellies and pushing the car through a particularly deep puddle, until we decided we could get no further and abandoned the car to walk up the remaining track. The rain had finally eased and we rigged in relative calm before descending the 100ft to check the air quality at the bottom. Although our lighters lit we found that there were pockets of bad air in the passages that made harder work of exploring than normal. We decided to keep a check on air quality, but to continue to explore. We headed down North passage first through some very sticky wet mud until I crawled through a particularly wet contortion to find a dig face and the end of the passage. Spinning around in the small space I went back through with half my head submerged to a grinning Andy. Although I offered to wait for him, he for some reason wasn't too bothered about squeezing through the foot deep water to see a dig face....his loss. Our next passage was the North West where we quickly reached the gated extensions. After a quick look up the ladder we headed off to the Southern passage. We were soon at the breakthrough point in the great rift and at the taped extensions. These continued for 80m or so to end at a choke. Again we poked our heads in to a number of holes for a look, finding Donkey Kong Aven and then I spotted a pulley system and some rope. Popping down the hole I was soon in some flat out crawling which went and went and went until finally closing down too tight to follow (I later found out this is Olympic Stroll which goes for 65m). Realising Andy wasn't following I scampered back to him and we pulled on some very muddy kit for the prussic back up. Finally changed and warm in the car we decided whilst we were in that neck of the woods that we'd continue on to find the location of another on Andy's bucket list 'Rowter Hole'. We poked around a couple of big sink holes on the way over to the farm and there asked directions, which turned out to be through the farm to a tree line and then just the other side. 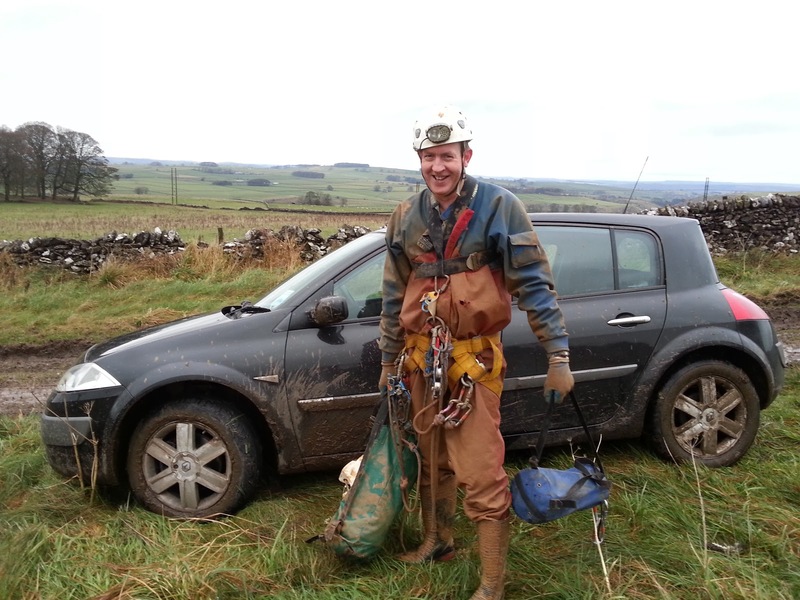 Again getting very muddy on the way we quickly found the gated shaft and happily trotted back to the warmth of the car.